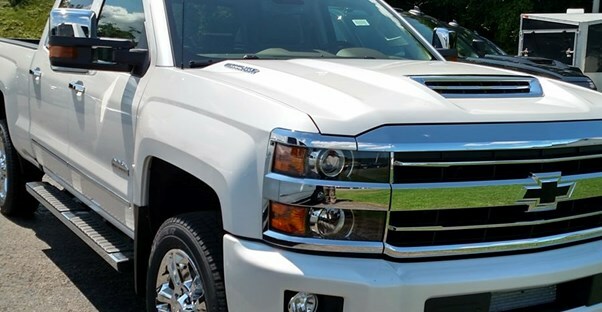 Which 2019 Chevrolet Silverado 2500HD is Right for You? The 2019 Silverado 2500HD is ready to tackle any job you need, whether it’s on the road or a worksite. Along with choices in cabs, beds, and engines, you can choose a trim level that fits your needs. But should you go with the affordable WT or the top-tier High Country? Chevrolet focuses on customization so your truck can handle a broad range of jobs. There are four options for the size and shape of your Silverado, two cab sizes paired with two box lengths. You can choose from a double cab with a standard or long box or a crew cab with a standard or long box. This will affect cost and performance, and not all cab options are available with all trims. The Silverado also comes with two main engine choices. The first is a 6.0-liter Variable Valve Timing V8 SFI engine that produces 360 horsepower and 380 lb.-ft of torque. The second is a Duramax 6.6-liter Turbo Diesel V8 engine, which, coupled with an Allison transmission, can put out 445 hp and an incredible 910 lb.-ft of torque. The Duramax engine may come with additional features for some trims. Additionally, all trims are available in two-wheel drive, with the option to upgrade to four-wheel drive. Technically, there is a third engine choice, though it's a V8 that uses compressed natural gas or liquefied petroleum gas (aka propane or butane) for fuel. As these vehicles are generally bought by specific niche drivers, we will focus our review on the Silverado 2500HD models that have more traditional mass appeal. The 2019 Silverado 2500HD WT is the least expensive option at $39,695. This is the price of the two-wheel-drive crew cab with standard box and 6L VT V8 engine. When properly equipped, the WT has a maximum 9,300-pound gross vehicle weight rating and 14,500 maximum trailer weight capabilities. It also has a maximum payload rating of 3,534 pounds. The gas engine has a 4.10 rear axle ratio, while the diesel engine has 3.73 rear axle ratio. With these numbers, the WT is a beast that’s ready to take on anything. Because the Silverado is used in the toughest of conditions, it also comes with great warranties. It includes a bumper-to-bumper limited warranty of 3 years or 36,000 miles, as well as a corrosion warranty for the same duration. The corrosion warranty includes a warranty against rust-through for six years or 100,000 miles. The Silverado 2500HD also comes with a powertrain limited warranty for five years or 60,000 miles, and roadside assistance with courtesy transportation for five years or 60,000 miles. With the power and capabilities of this vehicle, you can forgive Chevy for not loading it down with extra features, This is definitely a base model. That said, it does include a four-speaker audio system with a 4.2-diagonal color screen, AM/FM radio, USB ports, and an auxiliary jack. On the safety front, the WT includes StabiliTrak, which is a stability control system with Proactive Roll Avoidance and traction control. There is also a rear-view camera integrated with the standard 7" color infotainment touchscreen. The 2019 Chevrolet Silverado 2500HD WT also includes a Teen Driver mode and tire pressure monitor system. The LT starts at $44,995 for the two-wheel-drive crew cab with standard box option. Since it has the same engine as the WT trim, the LT has all the same capabilities. That said, it does include more features than the trim below it. On the exterior, it’s equipped with deep tinted glass and EZ Lift with Lower Locking Tailgate. The tailgate is easy to lock, using the same key fob as the rest of the vehicle. The interior of the LT improves to include an 8" color touchscreen infotainment system. There is also available built-in 4G LTE Wi-Fi connection, which may be necessary if you use your vehicle for work outside of an office setting. The LT also includes Chevrolet Connected Access with 10 years of standard connectivity. This allows the driver to perform select vehicle diagnostics and receive dealer maintenance notifications. The LTZ starts at $50,795 for the two-wheel-drive crew cab with a standard box. There’s no regular cab option here. That price jump may seem like quite a bit, but it has several features that make your Silverado 2500HD safer and more enjoyable to drive. Externally, door handles, mirror caps, and body moldings upgrade from body color to chrome. The interior comes with a 110-volt AC power outlet, heated driver and passenger seating, and power-sliding rear window that has a defroster. For convenience, there is a remote vehicle starter system, plus an integrated trailer brake controller and trailering equipment package. The High Country is the top-tier trim for the 2019 Silverado 2500HD. It starts at $57,195, which gets you a two-wheel-drive crew cab and standard box. Chevy’s given the High Country plenty of added convenience and comfort. The High Country comes with its own feature package, which adds several features like a Bose sound system and trim-specific cosmetic changes to the exterior of the Silverado which makes it look even more rugged than before. For example, the High Country trim rides on 20-inch chromed-aluminum wheels. There are also 6-inch chrome assist steps for easier entry and exit of the truck cab. The High Country is also the only trim that comes standard with the Driver Alert Package. This package includes high-tech safety features like forward collision alerts, lane departure warnings, and front and rear park assist.